Go here How Many Vegans Are There? to sign up! Promote veganism as a fair and sustainable lifestyle. Advocate for a more plant-strong diet and communicate its benefits for health. Offer more vegan options in public institutions such as schools and hospitals. Listen to many organizations’ plea for a fairer sharing of wealth around the globe. 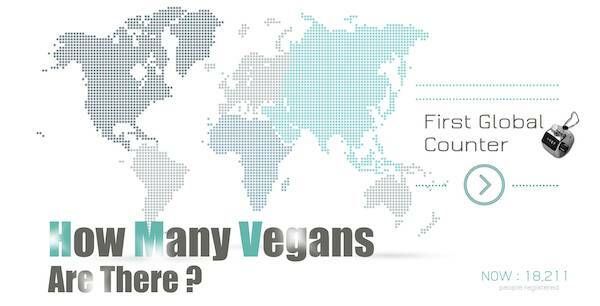 Witness and be proud of the constantly growing number of fellow vegans. Build a reliable and independent database. Make a case for ethical and green initiatives to live in harmony with nature, other species and ourselves. All over the world, volunteers have translated our Why? section into their native language. Check out their work—more than 20 languages now! Help us spread love, compassion, freedom and justice. Wanna help? Translate into your language if it’s not listed here. Discover comments left by registrants worldwide. Together, we spread love, hope, compassion and justice. No to speciesism! Print and share so that more people register. Post wherever possible in your community: vegan/veggie restaurants, schools, universities, bulletin boards.